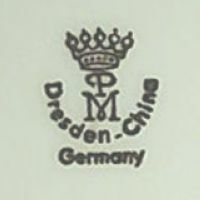 This company was founded in the year 1901 by the former printer Friedrich Eger together with his son Herrmann and the first production run was started shortly before Christmas the same year. Manufacturing mosly vases and mocca cups intended for the American market the company with a steady workforce of sixty people soon started international trade, steadily expanding all the time until the workforce reaced a peak of 170 people in 1930. International customers were mostly found on the Leipzig fair, an event that the company never missed between 1924 and 1976. In 1937 the company had reduced its workforce to 140 workers and was run by Eger's youger son Franz Eger who was then forced to stop production shortly after the outbreak of WWII. After the war it took until June 1946 before Hans Ziehm together with a number of old employees finally was able to restart production. Three years later the first export transactions where made, this triggered a constant rise in sales and production output. 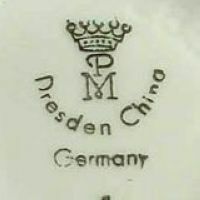 After the founding of the German Democratic Republic in 1949 the business remained a privately owned company. In the year 1969 the steady workforce had reached the number of 125 people again and the main focus where gifts and souvenirs: vases, chandeliers, mocca cups, bowls and baskets in cobalt blue and sometimes even glass decoration. Eighty percent of the products where made for export to Australia, Belgium, Canada, the Netherlands, Switzerland and the US. In the year 1972 the company (like many others) finally was nationalized and renamed into ⇒V.E.B. 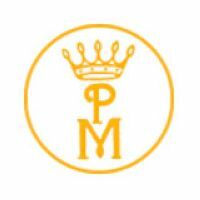 Porzellanwerk Martinroda and declared part of the V.E.B. Zierporzellan Lichte combinate. 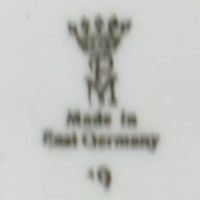 In January 1977 normal production was stopped as the factory was taken over by the Porzellanwerk Ilmenau which used the factory as decoration division. Things went quiet until the German Democratic Republic ceased to exist and in 1990 the factory was reprivatized again. Back on the market with its old name the company instantly became involved in the struggle of getting a foot into the new market. At the time of writing this over fifteen years have passed and there is still no homepage available. It seems the company took part at the IHM fair in München as exhibitor during March 2004 and it is known that the proprietor during that time was Hans Holland-Moritz. 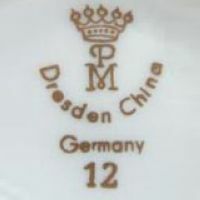 The marks used by this company are a perfect example that the often quoted rule of thumb "Every East German item made after 1949 was automatically marked GDR" is worthless. 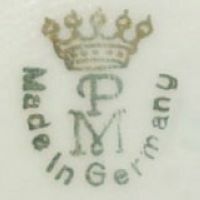 Like the Martinroda factory, many companies after the founding of the German Democratic Republic (up to shortly before their final nationalization) simply continued to mark 'MADE IN GERMANY'. 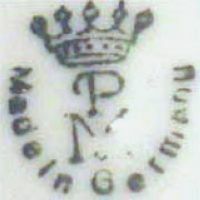 Note that the company did not use their own mark from January 1977 until 1990 as they worked as decoration department for the leading combine factory in Ilmenau and all items decorated in Martinroda carried a generic Ilmenau mark which today makes it nearly impossible to say which factory actually was responsible for the decoration of any given Ilmenau item from that period. 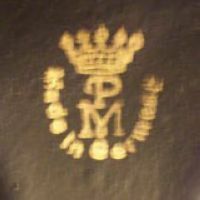 Gold version, most probably the first version used from 1901 onwards. No date known, everything from 1914 onwards until around 1972 is possible. No date known, dark green. Same as before: everything from 1914 onwards until around 1972 is possible. 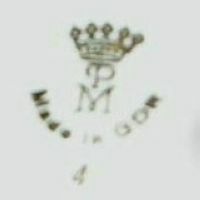 No date known, fairly rare two-colored version of the mark with a golden crown and the rest in dark green. 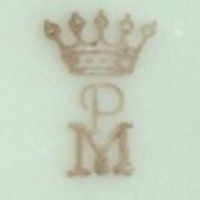 No date known, a version completely in gold. Only used for a short period of time (1969-1972? ): the hard to find 'MADE IN EAST GERMANY' version. 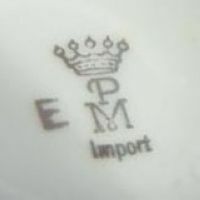 No date known, the 'IMPORT' mark is found on pieces exported to Poland. 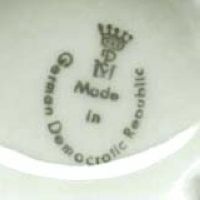 Used between 1972 and January 1977. Company logo and mark used 2004.